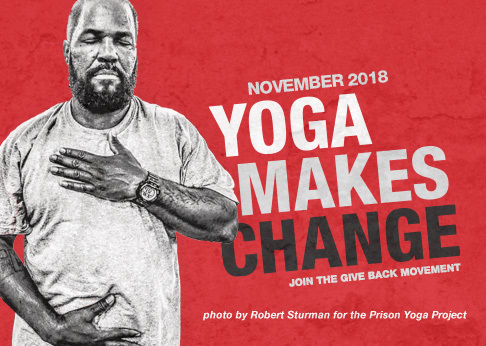 James Fox is the founder and director of the Prison Yoga Project, an organization dedicated to establishing yoga and mindfulness meditation programs in prisons and rehabilitation centers worldwide. Since 2002, he has taught yoga and meditation to male prisoners at California’s San Quentin Prison, as well as other state prisons. His book Yoga: A Path for Healing and Recovery, published in January 2010 through the support of the Give Back Yoga Foundation, has been requested and sent free of charge to over 8,000 prisoners. James provides trauma sensitive, mindfulness based teacher trainings in the U.S. and internationally for yoga instructors who are interested in leading classes in prisons and rehabilitation facilities. He has broad and extensive training in various yoga and meditation disciplines, and is specially trained in applying yoga practices for addiction recovery and trauma related issues. Upon receiving his teaching credentials in 2000, James began his mission of sharing the psychologically therapeutic benefits of yoga and meditation with at-risk populations, including the incarcerated. In addition to his work with adult prisoners, he has experience teaching yoga and mindfulness practices to at-risk youth in juvenile detention; at a residential treatment facility for boys; and for an inner city gang-related community program. In 2003, James established the yoga curriculum for the Peacebuilders Initiative, an annual weeklong summer intensive for Chicago teenagers that focuses on youth learning community leadership, conflict transformation and peacemaking skills. James is also on the staff of the Insight Prison Project, a California based non-profit that is a leading restorative justice agency involved in prisoner rehabilitation. He has served Insight Prison Project for several years as a facilitator of victim/offender education, violence prevention and emotional literacy classes for prisoners. In 2008 and 2009, James was awarded U.S. State Department Grants to advise and train people in charge of governmental and non-governmental prisoner rehabilitation programs in Guatemala and El Salvador.